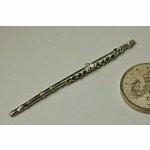 A pewter dolls house flute, 2 inches long. Can be painted or left as it is. A collectors item not a toy.